BUD, seemed to take to them the most, so the CD is yours all I need is an address to mail it to! Red Bank, NJ is the home of our next band, Woodfish and include Steve Kalorin (bass) and Dominic Kalorin (drummer), Jimmy Counihan (singer), Doug Mikula (guitar and Don "The Guy" Honeycutt (sax). This is definitely a Rock and Roll band with influences including Red Hot Chili Peppers, Jimi Hendrix, Led Zeppelin, Rush, Spin Doctors, The Black Crowes, Sublime, and Pearl Jam. The music of Woodfish can be described as a combination of rock, jam, funk and progressive styles which, infused together, provide audiences with an intoxicating and entertaining musical experience. Whether playing in a concert hall or an intimate barroom, in front of 3 or 30,000 people, Woodfish remains true to the spirit of rock and roll by bringing charisma and passion to every song they write and perform. At a Woodfish show a wide range of audiences, from young children to baby-boomers; hip-hoppers to punk rockers; tweens to teens and college students to jam band enthusiasts, are often seen moving and grooving together throughout an explosively energetic performance which typifies the live Woodfish experience. I really like this band. They have a tight sound and they capture the spirit of rock and roll. I actually hear some Blues Traveler in their music too. Their website can be found HERE and their myspace page is HERE. Hope you enjoy them also. I have 4 copies of their EP called BREATHE, so 4 of you can request it! These are two of the songs, the first is "Love Another" and the second is the title track "Breathe". Next up is the band KaiserCartel from Brooklyn, NY and is comprised of Courtney Kaiser and Benjamin Cartel. "We've been compared to Gram Parsons & Emmylou Harris," says Benjamin. "I think we're more like Lucy and Ricky," adds Courtney. 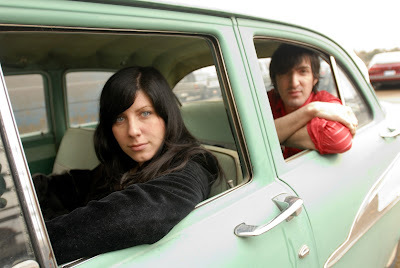 The dynamic duo of Courtney Kaiser and Benjamin Cartel, KaiserCartel, formed when the two Brooklyn based musicians joined forces to tour the country in the summer of 2004. Crammed into their Toyota Prius named Gertie filled with instruments, thrift store finds, and their furry friends "The Crayons", KaiserCartel has been touring regionally and nationally ever since. Courtney started her career at age 2 singing "I am a lonely little petunia in an onion patch" in Indianapolis, Indiana and has continued music throughout the rest of her life. She has studied opera, Indian classical music, and the folk music of South Africa. Courtney gets her inspiration from having no biological roots and her psychic ability to predict her breakups. Courtney has played with United States Three, The Prom, John Mellencamp, Sean Lennon and has recorded with The Wallflowers. Benjamin started his career by transcribing Black Sabbath"s "Iron Man" So that he could play it on the saxophone in the sixth grade. From there, he switched to the drums and played at his high school talent night in the only band that got thrown off the stage due to the amount of uncontrollable slam dancing! Benjamin gets his inspiration from crowded subway stations, local watering holes, and New York Femme Fatales. He has played with The Heartdrops, and Zombie Squad. KaiserCartel have a genuine, homespun, sound that is all their own. "Eclectic, infectious, music," are the words Benjamin uses to describe their lo-fi, song-driven style. "We want people to feel like a fly on the wall in our living room," says Courtney. Learn more about them on their website HERE or their myspace page HERE. No CD as of today, but it still might show up and if it does and you want it, let me know. The CD is titled MARCH FORTH. The two songs we present you with are "The Flood" and "Favorite Song". See you tomorrow with two more new artists! Woodfish reminds me totally of the Fabulous Thunderbirds. The biggest difference is the vocalis in Woodfish has more interesting phrasing. With KaiserCartel I really liked the first song, haunting. The second, not so much. Hey- Thanks for the CD! I would totally buy their CDs!! I've been swamped at work and figured, what's better when you're going over paperwork than music to make the time go by faster. I was shaking my moneymaker on my chair as I was listening to "Breathe" and bobbing my head and tapping my foot to "Favorite Song", and now it's in my head. I get the feeling Woodfish give a great live show. I could totally see myself taking a drive with this on my CD player. You'll be happy to know that I actually have a bit of a musical post up today. Cheers, Comrade Vinski!! Woodfish is tight - a perfect mix of vocals and instrumental! And Kaiser Cartel? Harmonizing reminiscent of one of my favorites - Simon and Garfunkel! DANA: Glad to intro you to two new artists...thanks! Woodfish is totally Blues Traveler. Whom I adore, so that is a good thing. bond, i am not ignoring you honey! i thought we had a two year comfortable relationship with a few comments a month. not leaving you at all! Miss Bee told me about the email, thanks bond, no hard feelings, just fear of what is happening. LOVED both of them today! Do I hear a little bit of O.A.R. in the first, or am I imagining it? STARR: Well...I am going to make you happy! I knew I was picky, but I didn't realize I was this picky. Or maybe it's not about being picky so much as it is about just being particular about the sounds I enjoy. I do know that I like this feature of yours.